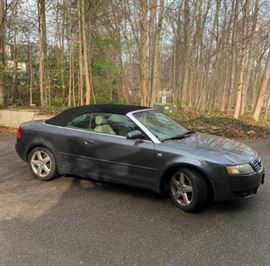 2005 Audi A4 Quattro Cabriolet Convertible, 3.0L V6 Cylinder, Automatic Transmission, Door 2 in Dolphin Grey Metallic, Blacktop camel leather interior. Features Power Windows, Locks & Seats, AC/ Heat, Kenwood BOSE Speaker System, Climate Control with Large LCD Display, There are a few scuffs and dings as seen in the photos. The vehicle was garage kept and has 134,235 MIles has recently had a new battery and brakes, most work papers are included.